On Tuesday night, the Yankees (33-25) beat the Washington Nationals, 6-1, at Yankee Stadium in the first game of the series. The Yankees have won seven games in a row (and eight of their last nine) and their starting pitchers have impressively allowed two runs or less in all seven of those games. That is a recipe for success. Masahiro Tanaka had his first start at Yankee Stadium since coming off of the disabled list and was able to outpitch Nationals ace Max Scherzer. Tanaka threw seven innings and allowed five hits, one earned run and zero walks. He had six strikeouts and retired the side in order in the first, second and third innings. Scherzer, who had a 1.85 ERA coming into the game, allowed four earned runs and eight hits in 6.2 innings pitched. The only run that the Nationals scored off of Tanaka was a Bryce Harper homer in the fourth inning. Tanaka has had excellent command since coming off of the DL since he has 15 strikeouts and no walks in his two starts, and he has allowed one run in both of his starts lowering his ERA from 3.22 to 2.48. Since coming off of the DL, he has pitched like he did during his first 16 starts last season when he had a Cy Young caliber first three months with a 2.10 ERA (11-3). He would later go on the disabled list for 2.5 months due to a partially torn UCL after two ineffective starts. Tanaka and Michael Pineda (3.33 ERA) combine to form a reliable, dominant and elite top of the rotation that could give the team an edge in a playoff series. 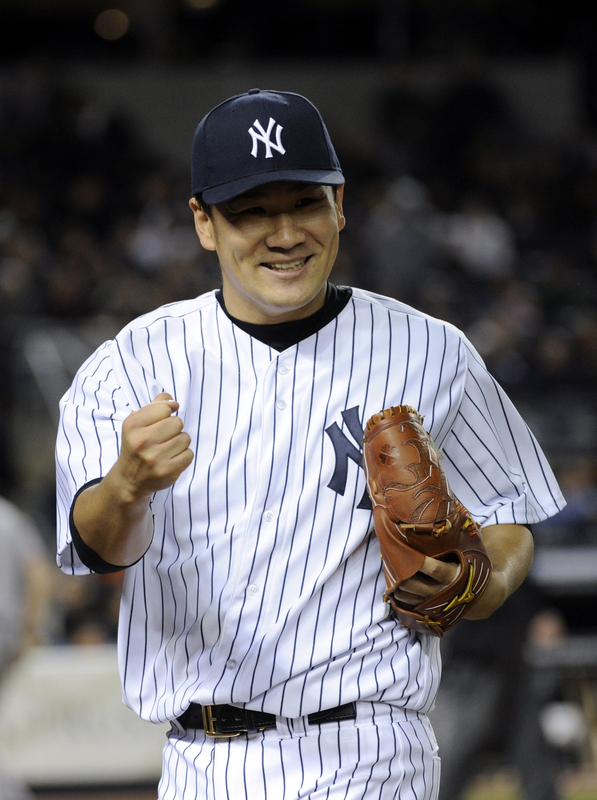 Tanaka incredibly threw 63 of his 87 pitches for strikes and proved to not let pitching at Yankee Stadium get to him. The Yankees scored two of their six runs on home runs. Stephen Drew hit a homer in the third to give the team a 1-0 lead and then hit another solo blast in the eighth to make the score 6-1. This was the second time in his last four games that he has hit two homers in a game and he hit a solid .292 in June to improve his average from .143 to .175. Drew’s average is still very low for an everyday player, but his nine homers are the second most among second basemen in the American League. Brian McCann hit a single to right in the seventh to score Brett Gardner and Alex Rodriguez and later in the inning Carlos Beltran singled to left to send Mark Teixeira home to make the score 5-1. Ramon Flores, who scored a run in the seventh on a fielder’s choice by Rodriguez, went 3-4 to raise his average to .269. Flores was sent back down to Triple-A Scranton before Wednesday’s game to make room for infielder Brendan Ryan. Flores, who has a strong arm in left field as he has thrown out two runners trying to score at home in his seven games, is arguably more valuable to the Yankee than Ryan while Jacoby Ellsbury in on the DL, but Ryan is back on the roster because he is healthy and they feel they have to use him since they are paying him a lot more. Ryan is starting Wednesday’s 1:05 p.m. game at shortstop giving Didi Gregorius a day off. Nathan Eovaldi will try to get his sixth win of the season and give the Yankees their eighth win in a row. Max Scherzer pitching for the Tigers. 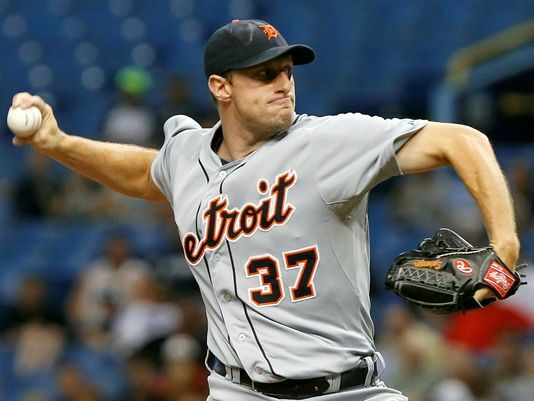 Max Scherzer, who had pitched his previous five seasons with the Detroit Tigers and won the Cy Young in 2013, has signed a seven-year contract with the Washington Nationals. The contract will be worth $210 million, according to Ken Rosenthal. The 30-year-old who is coming off of two consecutive All-Star seasons was the premier free agent pitcher and he took until January 19 to sign with a team partly because his agent is Scott Boras. He will give the Nats an even more imposing rotation than they had before, but his signing does mean that they have six starters for five spots in the rotation. Scherzer’s signing means that he would currently be in the rotation with Jordan Zimmermann (2.66 ERA in 2014), Stephen Strasburg (3.14 ERA in 2014), Gio Gonzalez (3.57 ERA in 2014), Doug Fister (2.41 ERA in 2014) and Tanner Roark (2.85 ERA in 2014). Even without one of these five pitchers, the Nationals will still likely have the best rotation in baseball next season. Scherzer would have greatly helped the Yankees rotation, but General Manager Brian Cashman has not had interest in him throughout the offseason because he does not want to give another long-term contract to a pitcher. The Yankees already have CC Sabathia on an eight-year, $182 million contract that expires in 2016 and Masahiro Tanaka on a seven-year, $155 million contract that expires in 2019. Sabathia, who is 34, has to reinvent himself as a pitcher this season because he doesn’t have the velocity on his fastball that he used to and is coming off of surgery to repair his knee. Based on the Yankees need for another starter and the Nationals current excess of starters it would makes sense if the Yankees traded for Doug Fister (30 & 31 in February) or Jordan Zimmerman (28). They are both on short-term contracts as Fister is on a one-year, $11.4 million deal and Zimmerman is on a two-year, $24 million contract that ends after the 2015 season. The Yankees should definitely make a trade especially if they can get some kind of a guarantee that they would re-sign. Zimmermann, who is in his prime, is coming off of two consecutive All-Star seasons and is entering his seventh MLB campaign. He made 32 starts last season, had a career-low 2.66 ERA, two shutouts, a career-high 182 strikeouts, only 29 walks and a career-low 1.3 walks/9 innings. He is an ace with excellent control who is represented by Relativity Baseball, which is a benefit for a possible future contract (they are not Boras). Fister, who is also entering his seventh season after playing last season for the Nationals and before that the Detroit Tigers and Seattle Mariners, is coming off of a season where he finished fourth in the National League in ERA. In 2014, he finished with a career-low 2.41 ERA, a career-high 16 wins, a very low 1.079 WHIP, 98 strikeouts and only 24 walks. Both of these pitchers are worth trading for. They both have similar career ERAs with Zimmermann’s at 3.24 and Fister’s at 3.34. Zimmerman has more years left as a top of the rotation starter as he is two years younger than Fister. On the other hand, since Fister is two years older and is not the strikeout pitcher that Zimmermann is, his contract after the 2015 season would likely be less than Zimmermann’s. The Yankees could put together a combination of top catching prospect Gary Sanchez, infielder Jose Pirela and one of their many relief pitchers for Zimmermann or Fister. Sanchez is coming off of a season where he hit 13 homers and drove in 65 runs with a .270 average in 110 games at Double-A Trenton. Pirela is a utility infielder that the Nationals could use and their bullpen isn’t very deep. Wilson Ramos, who is only 27, has been their starting catcher for the last four seasons and has one more year left on his contract. Sanchez could potentially be the Nationals starter in 2016. However, Sanchez is known much more for his offense than his defense so the Nationals could have him switch to first base in 2015. Sanchez at first would allow Ryan Zimmerman to switch back to his natural third base position. This trade makes sense for the Yankees because the need another starter so that Capuano will not have to be relied on next season, and the Yankees still have Brian McCann under contract at catcher for the next four seasons. With Zimmermann or Fister, the Yankees rotation could be Masahiro Tanaka, Michael Pineda, Ivan Nova (when he returns by June), CC Sabathia and Zimmermann or Fister. The Yankees recently traded for Nate Eovaldi, but he could be the odd man as he led the NL in hits last year. Max Scherzer pitching during the 2013 season. The current rotation for the Yankees, after the recent departures of Shane Greene and Brandon McCarthy, would be Masahiro Tanaka, Michael Pineda, CC Sabathia, Adam Warren and David Phelps. Ivan Nova will slot into the rotation likely in June when he is recovered from the Tommy John surgery he had on his right elbow last April. This is a rotation with health question marks and unproven pitchers at the four and five spots, which means that the Yankees need to overpay Max Scherzer in order to have a better season than they did in 2014. Scherzer will not turn 31 until the end of July and is coming off of two consecutive All-Star seasons. He has only thrown more than 200 innings twice in his career (2013 & 2014), which proves that he probably will not breakdown as early as a pitcher like Jon Lester, who has done so six times. Scherzer and Lester are both 30, but Lester has made 252 starts while Scherzer has made only 198. Lester has already signed a six-year, $155 million contract with the Cubs, and James Shields, who is the other marquee free agent, is not worth signing because he is 32 and has made 285 starts. Scherzer reportedly wants a six-to-seven year contract that could reach $200 million, which would be the second highest total contract ever given to a starting pitcher after the one Clayton Kershaw signed, but the Yankees need to listen to his agent, Scott Boras, because he will be able to be counted on to be an ace for the next three-four years. Scherzer won the Cy Young in 2013 and has had ERAs of 2.90 and 3.15 in each of the last two seasons. Also, he has averaged 32 starts, 197 innings and 209 strikeouts in the last six seasons. He needs to be given this contract because he is a strikeout pitcher who doesn’t allow many homers or walks as he hasn’t allowed more than 18 homers, walked more than 63 batters or struck out fewer than 240 batters in the previous two seasons. Scherzer has also done very well in some of the new sabermetric stats. He WHIP, which is walks plus hits divided by innings pitched, has been an outstanding 1.175 and 0.970 during the last two seasons. Scherzer’s FIP, which measures a pitchers effectiveness at preventing walks, homers and hit by pitches and causing strikeouts, was seventh in league in 2013 and 11th last season. He had the third highest strikeouts per nine innings in MLB with 10.29 and had the seventh best Wins Above Replacement (WAR) among starters. 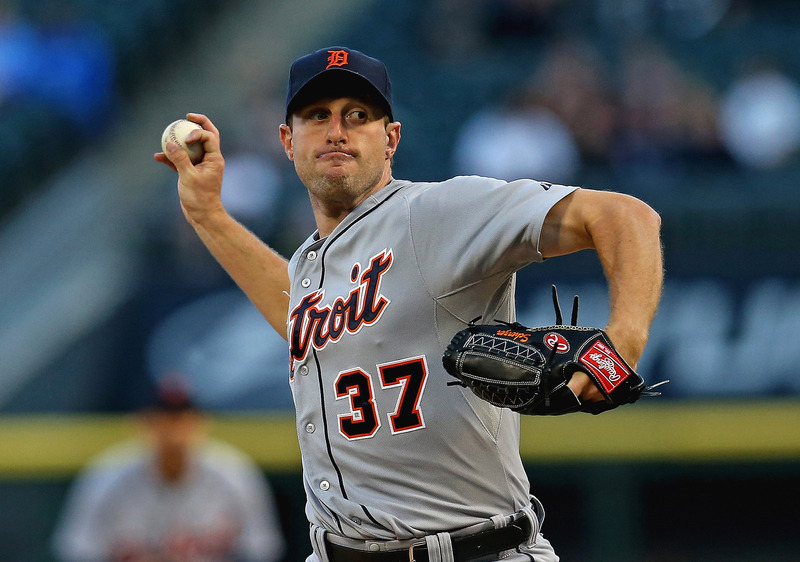 Scherzer, who will be starting his eighth season and seventh complete season after making his debut in 2008 with the Arizona Diamondbacks, has not had any significant injuries during his career with the Diamondbacks and Tigers. Tanaka and Pineda, who pitched very well when healthy last season, both had their seasons interrupted by injuries. Tanaka should be relied on next year and was an All-Star in his rookie season after posting stats of 140 strikeouts, a 2.77 ERA, 14 wins, 1.056 WHIP and only 21 walks in 136 innings. However, he missed about 11 starts after his start against the Cleveland Indians on July 8 because of elbow inflammation. An MRI revealed that he had a partially torn ulnar collateral ligament in his pitching elbow. He will be a bit of an unknown until he can stay healthy the whole season, but according to Brendan Kuty, Joe Girardi said he is expecting Tanaka to “make his 32 starts” in 2014. Pineda, who is an imposing pitcher with a 6’7″, 265 pound frame, had an outstanding 1.89 ERA and 59 strikeouts in only 13 starts. His strikeout to walk ratio was remarkable since he only walked seven batters, and his 0.8 walks per nine innings proves how effective he was. His curveball, slider and fastball combo make him very difficult to hit. However, after being an All-Star with the Mariners in 2011 and being traded to the Yankees in January of 2012, Pineda has had tendinitis in his right shoulder and then an anterior labral tear in his right shoulder that caused him to miss the 2012 season. He began the 2013 season on the 60-day DL as he was still recovering from the shoulder surgery he had as a result of the labral tear in his right shoulder. He was activated in July and pitched six games in the minors. He pitched his first game for the Yankees on April 5, 2014 and had his first of many dominating performances. However, while pitching in a simulated game while serving his 10-game suspension for pine tar usage, he suffered a Grade 1 strain of his Teres Major muscle below his right shoulder. This injury forced him to the miss the months of May, June and July. Tanaka and Pineda proved to be very effective when not injured last season, but their health question marks combined with Sabathia’s decline and the fact that Warren is best suited for the bullpen proves that Hal Steinbrenner and Brian Cashman need to give Scherzer the contract that he is looking for. If Pineda and Tanaka can stay healthy and only miss about five or six starts combined they would form an imposing top three in the rotation with Scherzer. The Yankees are already counting on Mark Teixeira and Carlos Beltran having better seasons than they did in 2014, which makes improving the rotation even more important towards making and advancing in the playoffs in 2015. The Yankees edged the Boston Red Sox 8-7 on Sunday Night Baseball. They won the second and third games of the series after losing the first against their rivals at Fenway Park, and ended their road trip to Arlington and Boston with a 3-3 record. David Phelps got the start for the Yankees and was not able to give the Yankees the quality innings that he had in his previous starts. Phelps had a 3.29 ERA in his last nine starts, but he allowed five runs in two innings Sunday night. The Yankees were able to get their second win in a row because of a great offensive output, but Phelps might have to miss his next start because of right elbow inflammation. “We will see how he is tomorrow,” Girardi said. “He was pitching well. He had an MRI (a few weeks ago) and the tests came back negative. I think he will pitch again, but it might not be his next start.” The inflammation is a little worse now, but Girardi didn’t seem too concerned. Going back to the win against the Rangers on July 29, the Yankees have scored a combined 26 runs in their last three wins and 14 runs in their last two wins. Brett Gardner and Stephen Drew, who was acquired just before the trade deadline from the Red Sox, drove in a combined seven of the eight runs. Gardner drove in three including his homer off of Craig Breslow, and Drew had four RBIs from a fielder’s choice, a double and a single. Gardner was only a triple away from the cycle. He hit .478 with five homers on the six-game road trip. His homer in the sixth, which ended up being the game winner, was his 15th of the season after hitting a career-high of eight in the 2013 season. Gardner’s double to deep right scored Carlos Beltran and Drew to tie the score at three. He has been an offensive catalyst and has given the team many more homers than Girardi expected. “Hopefully we can take this game home with us, get on a roll against the Tigers and maybe get a little winning streak going,” Gardner said. Drew has made a seamless transition to second base after not playing the position in his previous eight seasons in the majors. To end the second inning, Drew made an outstanding play where he caught a grounder near second base and was able to throw across his body to Mark Teixeira at first for the out. His single in the fifth that scored Brian McCann and Chase Headley tied the score at seven. Drew has a .272 average in his three games with the Yankees, and in 16 games since 7/11 he has hit .268, which is a great improvement from his first 25 games. Drew has a career average of .261 and a .183 average right now, which proves that he should continue hitting the way he has recently and not how he hit earlier in the season. Headley drove in the run that wasn’t one of the seven credited to Gardner or Drew. Headley’s double to left in the fifth sent Beltran home for his second run scored of the game. After Headley’s hit on Sunday, he has one hit or more in 10 of his 12 games since coming to the Yankees from the San Diego Padres. Headley and Drew have both proven to be quality additions by Cashman since they have performed so far and are upgrades at their respective positions. After Chase Whitley allowed two runs in relief of Phelps, Esmil Rogers, Dellin Betances and David Robertson combined to throw five hitless innings. 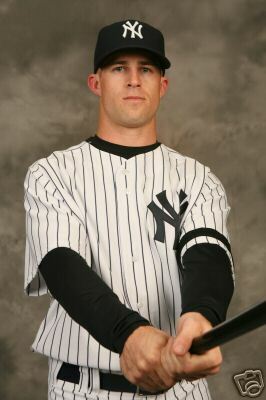 Rogers was acquired off of waivers from the Blue Jays on July 31, and he was able to win his first game with the Yankees after not allowing a hit in three innings and striking out three. Rogers had a 6.97 ERA before being sent to the minors by the Blue Jays on May 21, but he pitched very well in AAA and could replace Phelps if his inflammation keeps him out. Betances, after hitting triple digits on Saturday, had two strikeouts and picked up his 17th hold of the season, and Robertson recorded his 29th save in 31 chances. Robertson was helped by Brock Holt lining into a double play as a result of Mookie Betts attempting to steal. Pineda threw 94 MPH 3.1 innings on Sunday for the AAA Scranton RailRiders. He allowed three hits and no runs in his 58 pitches. This is an encouraging sign and could mean that he will only need one more rehab start. If Phelps only misses one start, Pineda would likely replace Chris Capuano. The Yankees are now 47-2 when leading after eight innings. This was their eighth straight comeback win. The Bronx Bombers will start a seven-game homestand with a four-game series against the AL Central leading Detroit Tigers on Monday. It will be Brandon McCarthy, who has a 2.55 ERA in four starts with the Yankees, against Max Scherzer, who is 13-3 and won the Cy Young last season. The Yankees are five games behind the Baltimore Orioles for first in the AL East and only 1.5 games behind the Blue Jays for the second Wild-Card.